Our online personal coaching and training programs are designed to give you ongoing one-on-one support to enable you to stay on track with your cycling and achieve your season goals. Each program is carefully tailored and configured by Sports Scientist & Level 2 Cycling Coach Michael Jordan, who works with Australian Cycling Representatives Kerrie Meares, Emily Rosemond and Shane Perkins to ensure that your program is a perfect fit for you! 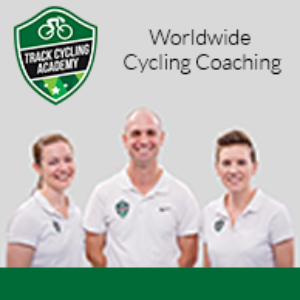 The Track Cycling Academy’s online personal coaching and training programs are designed to give you ongoing one-on-one support to enable you to stay on track with your cycling and achieve your season goals. Programming and analysis is lead by Physiological Performance Analyst and Cycling Coach Michael Jordan, who has a background in elite sport and cycling. Each program is carefully configured and Michael works with Head Coaches and Directors Kerrie Meares, Emily Rosemond and Shane Perkins to ensure that your program is right for you and contains all the elements required to achieve your goals. The Online Coaching Program is limited to a few places at a time to allow our coaching team to dedicate themselves to your training analysis, programming and ongoing reviews. Our team believe that carefully crafted preparation and planning is the key to cycling performance and we have recruited the world’s best team to deliver world class training plans and support. Motivated Mindset, Clear Realistic Goals and an Ability to commit to a plan! Success. Coach Emily, Kerrie & Michael has been notified of your message.